Although wheat is a whole grain, it’s often divided into the three components of bran, germ and endosperm during its processing. By itself, wheat germ is a wholesome and finely textured addition to hot or cold cereal, baked goods and protein shakes or smoothies. It has a number of potential substitutes, some of which are more common than others. 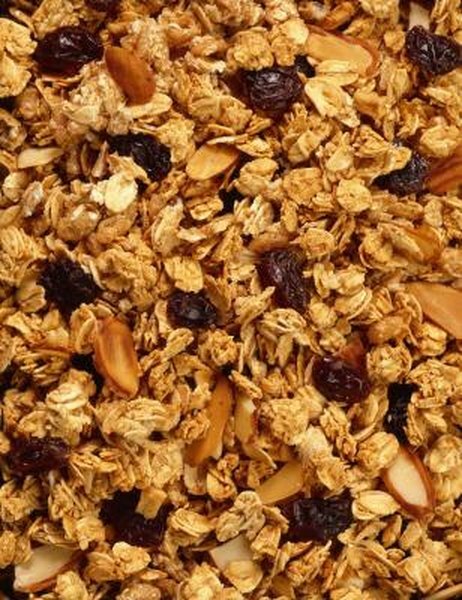 Wheat bran and ground flaxseed are two nutritionally dense substitutes for wheat germ that can work in baked goods or as garnishes on top of food. Wheat bran has just 30 calories per 1/4 cup but also boasts 2 grams of protein and 6 grams of fiber. Ground flaxseed is even more fiber-rich, with 7.5 grams per 1/4 cup. However, it’s also a heavier option, as 1/4 cup has 150 calories and 12 grams fat. In contrast, crude wheat germ has 105 calories, 6.5 grams of protein, 3 grams of fat, 15 grams of carbohydrates and 4 grams of fiber per 1/4 cup. For people who avoid wheat germ because of issues with gluten intolerance or celiac disease, wheat bran is an inadequate substitute because it can exacerbate the same negative health issues. In baked goods, gluten-free substitutes for wheat germ include oat bran, rice bran, ground flaxseed and ground nuts. For a topping or garnish, try coarsely ground nuts or puffed brown rice. Although substituting flour for wheat germ doesn’t work in toppings and garnishes, it is successful in baked goods. According to the University of Colorado Extension, 1 cup of all-purpose flour can stand in for 1/3 cup of wheat germ and 2/3 cup of all-purpose flour in any recipe. Adding more flour is a better choice than simply taking wheat germ out of a recipe, as balancing the wet and dry ingredients by staying true to their original amounts yields a superior result. When you’re using wheat germ in baked goods, you’re working with specific chemical formulas that may not be as successful if you substitute ingredients. Although wheat germ does not normally alter the texture or flavor of baked goods in a dramatic way, removing it from a recipe or replacing it with a different substance may negatively impact texture or flavor, so it’s wise to start out by making small adjustments to any recipe.